All transactions are safe and secure with a reliable history in online purchasing behind each of our associates. 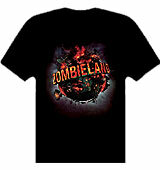 Buy the Zombieland t-shirt to own Zombieland clothing and merchandise. These official Zombieland t-shirts feature the movie logo displayed at the beginning of the film. Whether your favorite star is Jesse Eisenberg, Woody Harrelson, Emma Stone, Abigail Breslin or Billy Murray, this tee is sure to satisfy you and get some hysterical conversations started. Be sure to check out the rest of our zombie t-shirts, costumes and Zombieland merchandise like Tallahassee's hat. Our selection will make you nut up or shut up. In addition to the Zombieland tee above, browse the Zombieland Clothing Gallery for more apparel like men's and women's clothes, kids shirts or hoodies.